If inexpensive, low in alcohol, lovely sweet fruit, and something that goes with dessert is what you are looking for then hop on over to 2011 Ricasso Antica Casa Moscato d’Asti (#072272 $15.95). I often think, “Why stop drinking wine at the dessert course?”. This bottle is my answer, perfect with desserts, especially nutty ones, think almonds, or hazelnuts. I’ve always touted the Sketches portfolio from Tawse (3 times Winery of the Year in Canada). What I like about them is that they’re true to their home. They taste like they come from Niagara, if that makes any sense. Not emulating another style – they just take what’s there and squeeze it all into a bottle. This week, the 2011 Tawse Sketches Rosé (#172643 $15.95) is my shout out to Tawse. Although we’re hunkering down for a few more weeks of winter, Punksatawney Phil and Wiarton Willy notwithstanding, this rosé is viable with some poultry, appetizers, or by itself. Winter is a great time to get out of the rut since we’re all depressed, sad, and angry. So, put on your shorts, get a beach chair out in your living room, one of those M&M shrimp rings with some home made citrusy sauce, a good book and a bottle of this. You could even turn on the surf channel. Cruise? What cruise? Three chardonnays this week merit a look see. If it’s your thing, buy them all and have a chawdonnay paw (pause) tay. Open some chips (anything but barbecue based on personal experience) and pour these babies. OK, maybe not chips, but look at some of the food recommendations below. First there’s the local entrant 2010 Malivoire Chardonnay (#573147 $19.95). What can I say about Malivoire? Great place to visit – informative and friendly staff – cool venue – lovely variety of wine and prices. I make sure to drop in every time that I‘m in Niagara. This one is medium-bodied, lots of interest and just enough oak for the oak-a-file but not too much. The next wine is a repeat offender, but different vintage of a solid American Chardonnay 2010 Simi Chardonnay (#673806 $20.95). This is awfully big. Why do we enhance ‘big’ with ‘awfully’? Not really a solid phrasing and misleading. This wine is not awful – it’s delicious! Last year’s version was not nearly as big as this. Those out there that crave a creamier chardonnay but still like a streak of minerality will love this. It has tons of fruit. I had this with pasta with lobster and a cream, parmesan, and basil sauce (a hint of garlic) – pretty large mouthfeel – rich and decadent. It was a great match. The last of the trio is an Australian chardonnay – 2010 Hill-Smith Estate Chardonnay (#361584 $19.95$). This is more aligned with the Malivoire weight-wise. I might say it doesn’t have the feel of oak that even the Malivoire does, but I could be shaving a point here or there. Lots to like in this true Aussie-style chardonnay. Let’s end with a wine that seems to always be around – 2010 Copper’s Creek Sauvignon Blanc (#957407 $17.95$) – it could become your go-to white. This is a typical kiwi sauvignon blanc with maybe a little less of the tropical stuff and a little more herbalness.. About this wine, one popular reviewer says, “My oh my”, which leads me to believe that they have been reading Fifty Shades of Grey. Slide your hand slowly on to the neck, feel for the cork with your eyes closed (you’ll know when you’re there ‘cause you’ll feel the cool sweat), very slowly insert ……….the corkscrew, with your fingers playfully clasping lightly turn the handle again and again and AGAIN, leveraging not once but twice until you hear that almost inaudible gasp. My oh my. And, just to keep comparing and encouraging some exploration (and excessive purchasing), why not pick up an Old World sauvignon blanc – 2011 Château de Pocé Touraine Sauvignon Blanc (#313569 $13.95). Great sipper and the price — Amazing! Buy one, try it, and go back for more. Wait it’s all gone, isn’t it? Come on take the plunge and get a couple. Repeat mentions. Tthis should be in caps – it would be 11 if the tuner went from 1 to 10 – I mean I’m shouting here – Buehler, Buehler – if you only pay attention to two paragraphs, make it these ones! The 2008 Beronia Reserva (#050203 $18.95) is again on the shelves. Yahoo! I’ve received about as much positive feedback about this wine as any other. I mean, at the price point, I’m not sure you can beat this. It isn’t big, chewy, or a fruit bomb. It’s a balanced, woody Rioja. I won’t drone on but – run don’t walk. But, wait there’s more. The 2010 Susana Balbo Signature Malbec (#079798 $19.95) – it was one of my Top Daily Sloshes for 2012. This is fabulous, regardless of price point. That is: it’s worthy of a wine double the price, IMHO (and, that’s kind of what this whole site is about, my HO). So, get a cart, not a carry thingie, and load up on these two wines. Need to know how to where to find the above mentioned beauties? click here. These are different enough to figure in completely different situations. But, lovely enough to, dare I say, pound by themselves. But remember: Pound Responsibly. Another entry from Argentina is the 2010 Lamadrid Single Vineyard Cabernet Sauvignon (#234518 $14.95). The price is pretty amazing. Get ready to be very pleasantly surprised. The review by Jay Miller of www.erobertparker.com says, it has a “forward personality”, which I didn’t find because I talk too much (and everyone out there that knows me is nodding their head) and didn’t give it an honest chance. I have had buckets of this. It’s balanced and full of typical cab flavours and with a touch of spice perhaps. Never underestimate the value of value (I should trade mark that). I’ve gone a few weeks without a Rhone wine recommendation. To avoid withdrawal symptoms, I thought that I’d better scour the shelves for something Rhoney. The 2010 Domaine de Grand Veneur Les Champauvins Côtes du Rhone (#076311 $18.95) does the trick. This is the new vintage of a very well-received recommendation from about a year and a half ago. You Rhoneheads out there should be very pleased with this. Full-bodied, smelling of the region – bushy, lavender, red stuff. Plenty good. Not often do Portuguese wines show up here and that’s an oversight on my part. I will start to search out some reds and maybe even whites that you can take for a test drive. This week, there’s a sturdy red – 2009 Aneto Red (#314930 $19.95). This red is of the country-side. It’s rustic but that doesn’t mean simple or harsh; it just feels like the kind of wine you’d experience while sitting on a stool watching the harvest. Actually you wouldn’t sit on a stool watching the harvest – you’d be expected to help. This wine needs time in the glass to release all that it has to offer. How many people out there love a big, age-worthy Napa cabernet? I see a lot of hands up! I understand, it can be really expensive, but it’s an experience that is worth chasing from time to time. And, I try to include them in my posts when I think that they warrant a cheer. This week, the 2009 Chappellet Signature Cabernet Sauvignon (#704254 $68.95) is one of those experiences. “Holy H – E – double hockey sticks”, you say. “That’s expensive, Bill”. No denying it, it’s D – A – Bachtrian camel – Dromedary expensive. Always wondered when I could use my Middle Eastern zoology credit. But, getting back to the wine, this wine will age beautifully for years and will drink now too – solid, just enough oak, tannins are kind. This is pretty awesome stuff. Personal declaration – I do not hold any of this stock and am basing my recommendation on the previous two years and the fact that this vintage is more or less comparable to 2007, which I have had, loved and stashed. Previous earnings are no guarantee of future earnings. Buy and hold I say. One of my first forays into finer (read: more expensive) wines was at a wine tasting here in London. It was a revelation due to several wines (Caymus Special Selection, Pol Roger Winston Churchill Cuvée to name a couple) but one was an Australian wine from Chapel Hill. It was the cabernet sauvignon and I know that I was blown away with the new, complex experience that I had. Well, we all remember our first time. Sad to say that I remember this ‘first time’ best. This week, I’m returning to that solid winery for a splurge – 2010 Chapel Hill Shiraz (#743989 $26.95). This wine will keep for awhile but can also be consumed now with burnt stuff, stew, etc. It’s not as heavy as you might expect. If you’re an Aussie shiraz lover, try this on and see if you can have one of those ‘first times’. FYI, their cabernet sauvignon is also on shelves starting Saturday – 2010 Chapel Hill Cabernet Sauvignon (#965830 $25.95). Haven’t had this vintage but if it’s anything like the one back in the ‘Summer of the Short Corn’, when I came of age, it will be fabulous. For a white splurge, latch on to the 2011 Château Fontaine-Audon (#745893 $27.95). This is Sancerre’s answer to New World sauvignon blanc. Actually, New World s.b is their answer to Sancerre. This is flinty, tight and still releasing all sorts of fruit – typical of the grape (gooseberries). I love this stuff! Plus, it’s so good with food. If you’re having it now, when it’s crisp outside, maybe try poultry with some kind of acidic sauce, perhaps citrus. Or, you can pop and pour on its own, or with some seafood. I usually don’t provide scores but David Lawrason of www.winealign.com gave this a 92! I’ve received a lot of feedback that the wines I recommend are already out of stock when people arrive to claim their prize. This is unfortunately a sad truth. In other cases the local LCBO is wanting for selection, or readers are outside Ontario, or outside Canada. So, I’m going to suggest a few ways to ensure that you get good wine to drink – which is the whole point, isn’t it? For the LCBO crowd, if a wine strikes your fancy, click on the link which will direct you to check availability in your area. If you see that one of your local stores is holding, you should be able to reserve a few bottles simply by calling the number provided with the location. Now, some stores don’t like to reserve after the Tuesday before the Saturday release but many will. I try my best to get the reviews out Tuesday, latest. Alternatively, check availability and get to the store Friday evening (as some stores stock in advance of Saturday) or early Saturday. If in Canada, but not in Ontario, click the following links for availability: Quebec; Nova Scotia; New Brunswick; Prince Edward Island; Newfoundland; Manitoba; Saskatchewan; Alberta; and British Columbia, plus there are independent merchants in your area that you will know better than me. Also in Canada, there are several direct online sales web sites. Wineonline.ca offers a great selection and from time to time free delivery. You may not see the exact same wine as I recommend but there is good information on in-stock wines and many are great values. A drawback is that you have to order in full cases and delivery to some places is expensive). Winery to Home is a great route to Canadian wines and they have a pretty cool Wine of the Month program, which makes for a fabulous gift. Another online merchant is Savvy Selections, I can’t vouch for them but the service looks good. Others worth exploring: Lifford Wine Agency, Hobbs and Company, Select Wines, Family Wine Merchants. If you know of others that you may have used, let me know your recommendations. If you are living in the US and want to get imported wine, you can probably access these wines direct through the merchant who may export the wine. Check the wine’s website (I will have this link on many occasions) or try googling the wine. Your search will turn up the merchants that carry the wine, or options to order directly from the winery. For less available wines, you can access one of the many web sites that sell wine directly: Lot18, is a worth a try. Live near a Total Wine store? Go nuts on the selection and happy sipping! If you are living elsewhere, I can’t really provide a solid recommendation. Europe and Asia have different cycles and marketing regimes. However, if you are in the UK and keen, there’s the following resource – Decanter magazine and web site (www.decanter.com) list the outlets for the wines they recommend, with pricing. It’s a stiff subscription but probably worth it. You could compare my recommendations with their assessment of that wine. Wrapping up, yes it’s true — this post holds no humour whatsoever. That’s because getting the right wine for the right price is a pretty serious business. Please let us know if you try any of these suggestions and you are successful or not. Mea Culpa! I received some serious feedback on this post. None can be published without censorship. It stems from my characterization of a Keenan cabernet sauvignon as being less ”sweet and consistent” than the iconic Caymus cabernet sauvignon. Well, I should be ashamed of myself. What I really meant to say was that, “if you want something a little less……um……straight forward and Napa Valleyish?,” the Keenan was a candidate. My post was taken by many to mean that I didn’t like Caymus. There is nothing further from the truth. I love the stuff. I have some in my cellar, er basement. Evidentiary proof: just this past Christmas, I shared a 2005 Caymus with my niece’s German beau and he said that he’d never had anything so great. I had to agree. So, please accept my apologies, but I stand with the reformulated comment that the Keenan brings more structure and stuffing to this wine than does the regular Caymus bottling.……ah…………I think that I’d better give up there. Keep the feedback coming – but be gentle. My beautiful niece’s wedding this summer was in Stratford at The Prune restaurant, which I highly recommend. I had a 2010 Pondview Cab/Merlot (#307561 $19.15) and it is a great example of a cab blend from Niagara. Great weight, very manageable tannins and good balance. If you like a lighter meritage blend with still lots going on, this is one for you. The name of the winery summons images of blue heron, salamanders, reeds, and algae. I actually like that picture – even the algae – very David Suzuki. Drink it with that space in mind. A less visited region in Spain is the DO Campo de Borja. That’s really a bit of a technicality actually as it sits awfully close to Rioja. This week there’s a great wine made with 100% granacha, or grenache as it’s called in France, 2010 Borsao Tres Picos Garnacha (#273748 $19.95). This is a solidly made full-bodied wine that Robert Parker says reminds him of Chateauneuf du Pape. I’m not sure that it does the same for me. What reminds me of Chateauneuf du Pape? A brand new mansion in old East York. Trying too hard? Too easy for Torontonians and difficult for the rest? Send in your answers. We find ourselves in an awkward situation again. A mencia-based wine and no clever line? I’m still waiting for my readers to bale me out on this. Surely there’s some word play that can be salvaged. Talk amongst yourselves. Plus, I really haven’t heard from you on what you thought of the other mencia wines that I’ve recommended. Keep throwing these out there? Stop the Madness? This week, I’m recommending 2007 Solar de Sael Crianza Mencia (#311902 $15.95). There are four things about this wine that work for me: 1) it’s biodynamic which makes me feel good about myself drinking a wine from a biodynamic producer – as in, “I’m drinking my way to a healthier planet”. 2) it’s got tons going on – depth, spices, lots of stuff. 3) I can cellar it for a couple of years, or drink it in the car on the way home. 4) it’s $15.95! 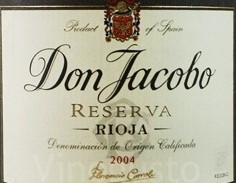 Lastly, from Spain comes the 2004 Don Jacobo Reserva (#313270 $17.95). Although they say ‘medium bodied”, this wine is pretty big in my mind. Send in your humourous guesses as to who Don Jacobo was/is. The grandpere of Zorro? Dawn Jacobo’s fraternal twin? This wine would go great with something substantial and chewy. Pick up this and the one above and compare. Yes, it’s a Columbia Crest wine again. The 2009 Columbia Crest H3 Merlot (#209874 $19.95) is on the slosh menu this time around. H3 stands for Horse Heaven Hills, an AVA (American Viticultural Area) in Washington State. Sounds idyllic, doesn’t it. Where do horses go when they die? Why Horse Heaven Hills, of course. It even rhymes a bit and had me singing the theme song from Ed, the Talking Horse. “A horse is a horse, of course….” This wine is a solid merlot with fresh swish and spit fruit. By that I mean that the fruit is there from the beginning to the end although there’s some muddling up of this with spice or smoke – can’t really discern. If you like New World merlot, pick this up! You can’t go wrong and you might have made a new best friend. This lineup (H3) is pretty bang on. Well, when I think of Spanish whites, I think of Albariño. It just says. “I like to be paired with shellfish, fish, and I’m even into grilling with the right partner.” Even though we’re mired in a deep freeze – well, that’s a lie, it’s been pretty warm actually in these parts – it seems that there aren’t a lot of opportunities to pair this wine. But, wait, there’s more (to quote Ron Popeil). This wine is good just sitting and sipping with friends – even the imaginary kind. This week, I’m recommending 2011 Señorio de Rubios Albariño (#314427 $17.95). These whites from Rias Biaxas have a salinity to them that’s mouth watering and hard to describe without PowerPoint. Grill a carp or just pop and pour. Another crisp white is the 2011 Joseph Cattin Reisling (#259788 $14.95). It’s an Alsatian beauty that needs food IMHO. It’s got great acidity that just lends itself to food that has some bite too. I’m thinking Thai food, curry maybe. Heck, at $14.95 you could even, gasp, buy two bottles and try with different things. If it’s chardonnay you crave, the 2010 Roch de Bellene Vieille Vignes Bourgogne (#299867 $19.95) is for you. It’s surprisingly round for an entry level Burgundy but still has a seam of acidity (yes, this one too!) that ensures that it’s not pretending to be New World – great citrus stuff going on too. A great comparison would be the 2010 Stonehedge Reserve Chardonnay (#311548 $19.95). This is a Napa Valley chardonnay and it brings some strong tropical flavours as opposed to the citrus dominance above. Maybe targeting the creamy chardonnay lovers out there or, residing in my home. There are two major blunders in life – never pass on a Rioja Gran Reserva under $30 and never go in with a Sicilian when death is on the line #favouritemovie. This week there’s a fabulous Rioja Gran Reserva. I recommended this same wine about a year ago. The story then was that I had a 2001 of these still sitting around and opened it one night. It did not disappoint – “beauty” as DC would say. This is from a vintage generally regarded as better than 2001 and is equally a “beauty” – the wine is 2004 Rioja Bordón Gran Reserva (#114454 $22.95). Not big but well balanced and the drinkability index is very high – very high. It’s gorgeous. I’m surmising that this will not be available in large quantities. Inconceivable. I feel that I need to declare my biases here. I’m doing a bit of that with a new space on my web site that lets you in on why certain wines get mentioned and others ignored. But, let’s not worry about that right now. I love Napa mountain wine, Mt. Veeder, Diamond Mountain, Howell Mountain, Spring Mountain (remember my faux pas last week?). Some of my best Napa moments have been from these AVA’s. It’s usually just so beautiful. It’s what the geeks call terroir. So, when I saw the 2009 Mount Veeder Cabernet Sauvignon (#708842 $49.95) I thought that I had to mention it. This wine is awfully good. Now, I won’t compare it to other California wines (compounding my Caymus error) but it is cellarable and good now with meat – the kind of meat that Napa district cabernet solicits – red, grilled, rare. Let it lay or breathe. There’s a great entry level pinot noir from Inniskillin – why classify as a weekend splurge wine, you say? Because it costs a bit more is all. I saw Natalie MacLean do a video tasting of this wine that piqued my interest (it’s pretty cool when you can use the word piqued – appropriately that is). So, I poured a glass and low and behold it is as advertised – clean and elegant. Sharp acidity that fits with a sit down meal or a finger food thing – 2010 Inniskillin Winemaker’s Series Select Vineyards Pinot Noir (#175174 $22.95). Is your interest piqued? In Italy, they say, “Chi mangia sulo s’affoga.” He who eats alone suffocates, I believe. If I knew the appropriate declension and future pluperfect in Italian, I would translate, “Those that drink alone suffocate.” However, I admit that infrequently there are evenings I’m on oxygen – gasping until my wife comes home. 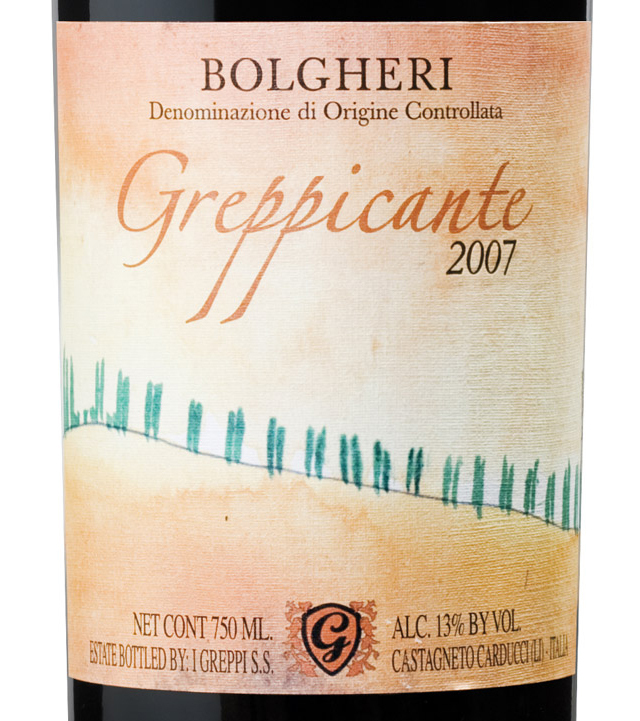 There’s a wine on offer this week that should welcome company to your home – no need to suffocate – 2009 I Greppi Greppicante Bolgheri (#170381 $23.95). This is a great blend of cabernet sauvignon (circa 60%), merlot, and cabernet franc. I recommended the 2007 a couple of years back. It was spectacular (#46 Wine Spectator’s Top 100) and this won’t disappoint either. Pick up a bottle to have with some Italian fare – sausage, tomato sauce, pasta. Awesome. And, I’d say a bargain at $23.95. I’d like to remind those of the Brancaia Tre a few months ago. This has the same vibe. I was treated to some great German Riesling over the holidays. I know that I don’t venture into these regions that often on these pages, but I do think that we owe it to ourselves to start reacquainting ourselves with these beautiful wines. “But, Bill, I find them too sweet.” My child, you are harkening back to the days of Blue Nun and Black Tower, marathon Monoploy games, knives, and the whirlies. Things have changed and although I still see people carting bottles of Black Tower out the door, most Mosel and Rheinhessen wines are not overly sweet. This week, the 2010 C.H. Berres Ǘrziger Würzgarten Reisling Spätlese (#301952 $24.95) should be your choice. This has minerality, fruit and a very nice finish. Go ahead and try this medium sweet wine on its own while sitting in a sunny window reading your new favourite novel – no, not The Hunger Games or other such teen literature – real novels only. Caution: this wine is not fit for non-fiction. There are two troubling trends that I’ve noticed through my interaction with readers: 1) People don’t drink enough wine – well, not enough to make me feel that I don’t have a problem; and, 2) people don’t seem to drink sparkling wine enough. I’d love to correct both those trends. We might oversell the prosecco here. Well, there’s no “might” as we actually do oversell prosecco here. But, rather than be dissuaded, I plow on with the NV Fantinel Extra Dry Prosecco (#297812 $14.95). Now, the last 6 characters are important. It’s $14.95! What are you waiting for? Bubbly goes with so much stuff and in so many situations – first offering to guests at the front door, alongside hor d’œuvres, before wings, after wings, with seafood, without seafood, before bed, first thing in the morning, and my favourite – with regular Goldfish crackers while watching The Daily Show at 11:00 pm, the glow of the television lighting up the room. “Can my neighbours see me in my housecoat?’, he wonders aloud. The other overrepresented wine here is Cava. I could fall on my sword and moan about how sorry I was that I don’t feature enough other sparklers, but why do that? Why not introduce a great little Cava wine – NV Valdosera Brut Nature Cava (#311738 $17.95), Just noticed in my re-read of above that I said “little”. Well, that’s not exactly the case. This wine has lots going on. If the one above is Ally McBeal, this one is Jane Kasmyrsky (not even checking the spelling and I know they are both anorexic – so bad imagery?). It’s what we’ve been expecting from Cava and not getting enough of until the last few years. Good for all the situations above, only I‘d switch out the regular Goldfish for 3 Cheese flavour.